Flowers, flowers, everywhere. 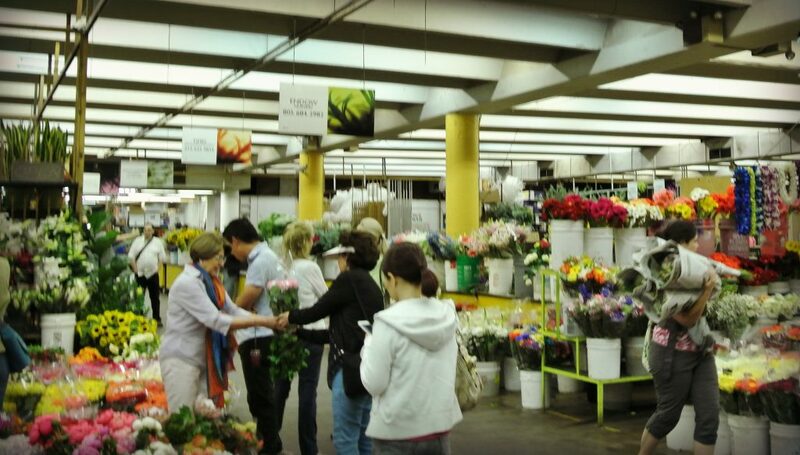 That’s what it’s like to visit the LA Flower Mart in Downtown LA, where you can get wholesale flowers by the bulk for yourself, an event, or even just a bouquet for a special someone. It’s there perfect place to don a casual look and shop for all the pretties. You’ll wonder why you ever paid the excessive prices to go to a florist! I had a special event I needed flower centerpieces for. After a florist had quoted me hundreds of dollars, I decided to do them myself. I used Pinterest to narrow down the look I wanted a – boho wildflower look. I watched a few YouTube videos to learn some basics of flower arranging and what type of flowers you need. 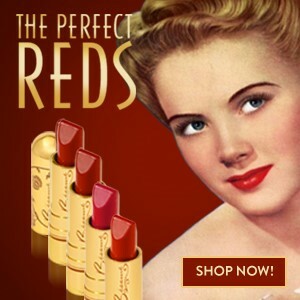 TIP: First, pick a color palette of two to four colors. 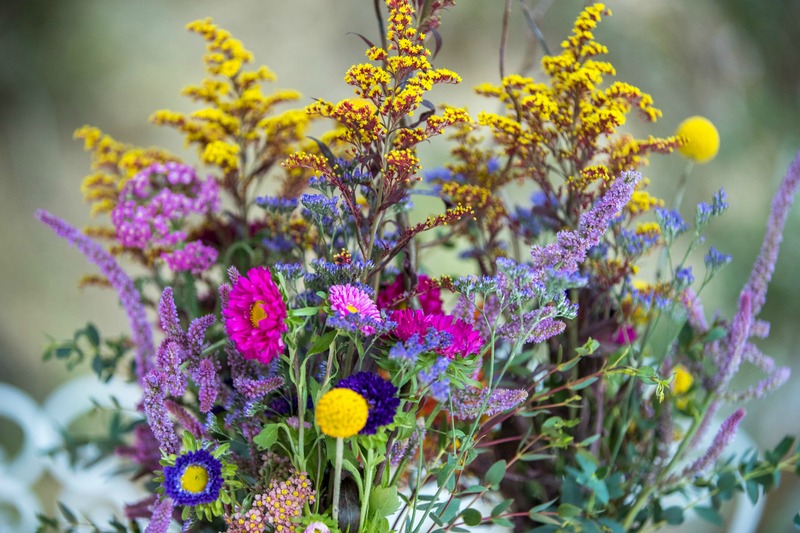 I went with jewel tones of yellow, purple, pink and orange – then look for one or two large focal flowers, some textured flowers, and some filler greens. 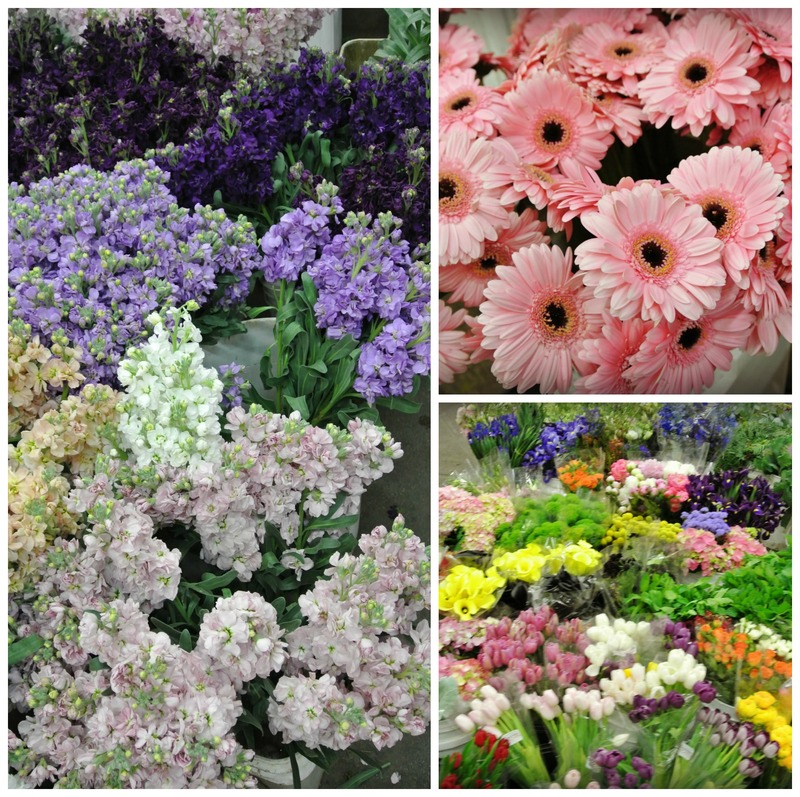 Since I’d never been to the Flower Mart before, a friend took me for an introductory orientation. I brought some print-outs of the Pinterest photos with arrangements I liked and looked for similar buds. 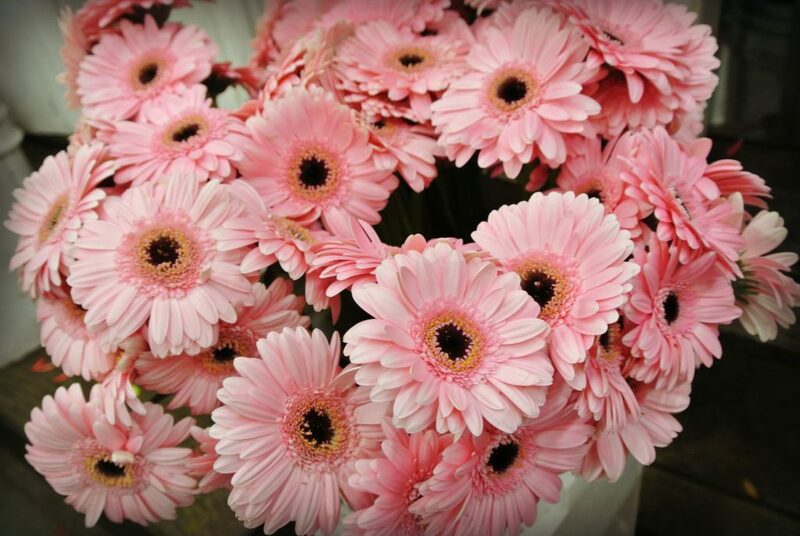 The LA Flower Mart is a lively place, full of vendors carrying every type of flower imaginable, just keep in mind everything is seasonal, and the inventory can change on a weekly basis. So it’s best to go as close to the event date as possible to see what’s fresh. You can preorder flowers with certain vendors and pick them up the day of the event, but I found that to be an unnecessary step. Instead, I just found a couple of vendors that had the majority of what I wanted and wrote down their names and locations. I also scoped out where to buy buckets to load up my purchases and rent a trolley to cart them around the market and to the car. Be sure to plan your visit for early in the morning to get the best picks and most vendors close up shop around noon. Since my event was on a Sunday when the market is closed, my plan was to return the day before and keep the flowers overnight in a cool place, then mke the arrangements at the venue before the event. As for vases, you can get some at the craft supply stores across the street. I got mine at the Dollar Tree, for you guessed, one dollar each! 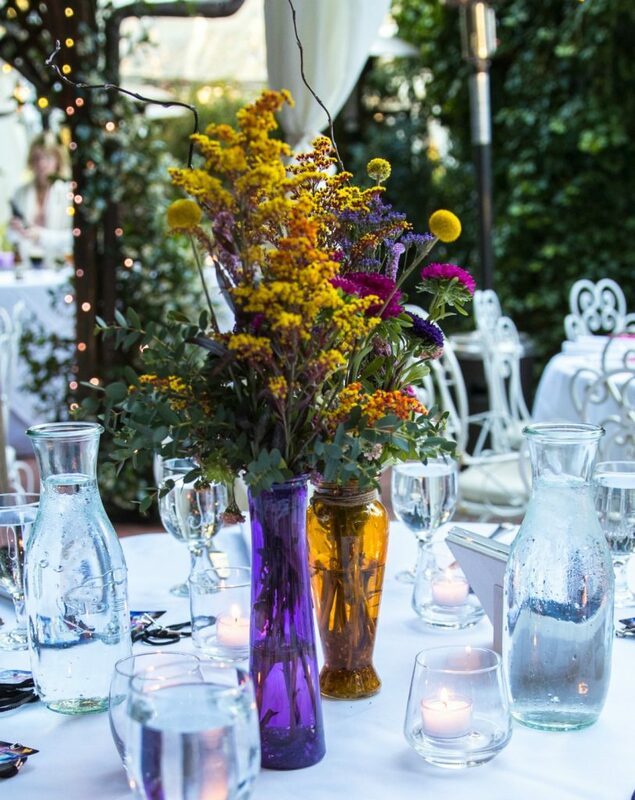 They worked perfectly – three tall, thin vases in my color palette colors on each table made for a full centerpiece. I spent about 150 dollars on flowers and 25 dollars on vases to make eight large centerpieces, which is big savings compared to hiring a florist. And it was fun picking out all the flowers. Some friends helped me put the centerpieces together, and I could not have been happier with how they turned out. For a day at the Flower Mart, wear a casual look that you don’t mind getting a little wet or dirty. You’re going to be pulling big bundles of flowers out of buckets of water and carrying your load to your car wrapped in newspaper, which can unleash its ink on your clothes. I opted for some festive red and white polka dot skinny jeans, a graphic t-shirt and flat shoes so I could do lots of walking to scout out my flowers. Just because you’re going casual, doesn’t mean sloppy. You can still make it cool and chic. 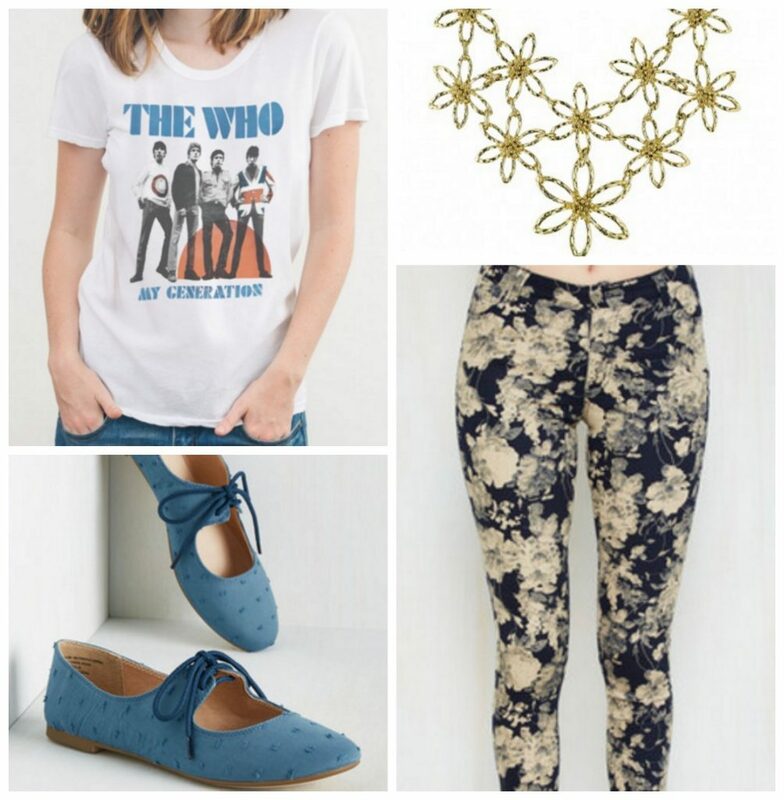 A pair of floral-print skinny jeans will you put in a flower-shopping mood. Rock it up with a classic rock band t-shirt like this one with The Who. I always like to add a pretty statement necklace to dress up a casual look, and this one with flowers will continue the theme of your mission. Throw on some stylish flats with a pop of soft blue and you’re good to go! Click the links to shop* this look!